Tournament of Roses president Richard L. Chinen has a pedigree that stretches from Hawaii to Pasadena. 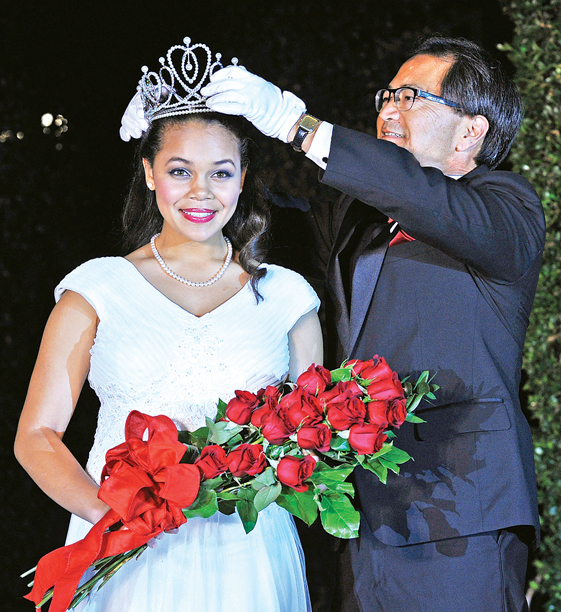 December is typically crunch time for the Pasadena Tournament of Roses, as its annual parade and football game this Thursday draws near and the organization races to make sure the big day comes off without so much as a wilted petal. 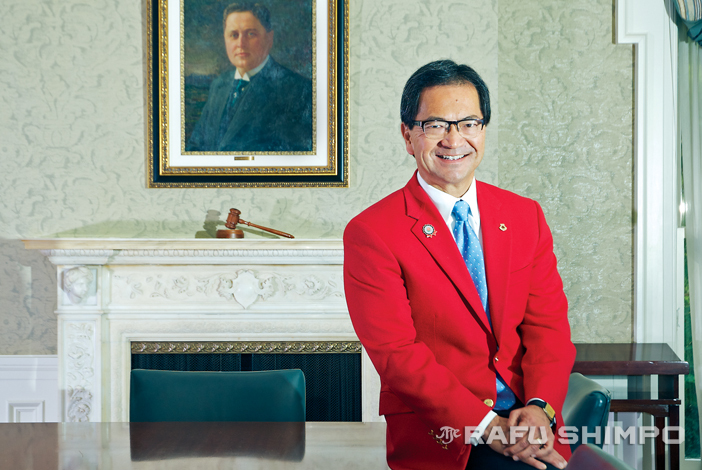 Just over two weeks before New Year’s Day, however, the tournament’s president for 2015 sat in his conference room, clad in the traditional tournament cardinal red jacket, without the slightest hint of nervousness. Seven years of preparation were reaching their apex, and Richard L. Chinen was cool as a bowl of shave ice on Kailua Beach. With nearly 1,000 volunteers working to put on Pasadena’s biggest day, Chinen is confident the duties are in good hands. “We have all these people putting their lives on hold to put on the best Tournament of Roses and to make Pasadena proud. My role is to represent this organization and all these people,” he explained, citing the dedication of the volunteers, including one who has served as a float driver for nearly 50 years. Born in Tokyo and raised on the Hawaiian island of Oahu, Chinen, 58, will make history as the first non-caucasian Tournament of Roses president, and assumed the dutiesafter having a daughter serve as the Rose Queen. Megan, one of his twin girls, donned the crown in 2004, and Chinen said the dedication and sacrifices made by the committee responsible for the queen and court were hard to fathom. Chinen said as a tournament volunteer and a father, he was particularly careful to keep the flurry of activity of his daughter’s schedule at arm’s length. “I wanted to stay as far away as possible, cause I was a tournament member, I knew we’d take some [criticism],”he explained. Also, we have identical twin daughters, so when the paper would come and she’s on the cover being crowned, we’d gently turn it over while having breakfast, because her sister’s got a life, too. The idea of inspiring stories – the theme of the 2015 Rose Parade, as he put it, “to pay tribute to those who have loved unconditionally, persevered courageously, endured patiently and accomplished much on behalf of others” – was in the back of Chinen’s mind well before he was offered the top job. He and his family had tossed around several ideas for a grand marshal by the time he picked up a copy of “Unbroken,” Laura Hillenbrand’s book about the World War II survival story of American soldier and Olympian Louis Zamperini. Though he had read the book about Zamperini’s life, he was unaware of the pending show business connection. Out of concern for his age – 97 – Zamperini was announced as the parade grand marshal in May, giving an extended period of time for the numerous appearances he would need to make in support of the parade. “I was afraid people would think we were going Hollywood on them,” Chinen said. The parade honor unfortunately fell into some uncertainty after Zamperini died less than two months after being named as the grand marshal. Chinen insisted there was never any thought of replacing him. Chinen’s father, a native of Maui, served during the Korean War with Army Intelligence, and met his wife in Tokyo. Richard was born there, and after four years in Okinawa, the family moved to Kaneohe. “I was just a military brat, and we lived on-base, in military housing, on Okinawa,” recalled Chinen, whose surname is a relatively common one in Okinawa. “One day, some boys and I were out in the back playing basketball after school, and there was a tall, barbed-wire fence behind our house, as there was all around the base. We saw a group of Japanese school kids, you know, with the black hats, black uniforms, walking home after school. They were yelling at us, and we were yelling back at them, as 10-year-olds will do, and pretty soon we started throwing rocks at each other. They couldn’t understand what we were saying, probably bad words, and we couldn’t understand them either. After graduating from Punahou High School, Chinen earned his bachelor’s degree from the University of Hawaii, then headed to Southern California. He was awarded the degree of juris doctor in 1982 from the Southwestern School of Law. He is a past president of the Pasadena Bar Association and a senior partner of the firm Palermo, Barbaro, Chinen & Pitzer. Chinen has a wealth of stories to illustrate his experiences with the Tournament of Roses, and it’s easy to see how he and his colleagues have arrived at the theme of “Inspiring Stories.” He has spent the last several years planning and organizing, delegating responsibilities, and criss-crossing the country and the globe in support of the tournament and its mission. During our interview, he took a particular joy in relating tales of visiting and selecting marching bands for the 126th Rose Parade. He described how a unit from Denmark will be the only band from Europe to make the 5-mile march down Colorado Boulevard on Thursday, and how its community rallied to come up with the funding for their trip. “This band is a treasure, and tens of millions will be watching,” Chinen beamed. He said being part of a marching band differs from earning a spot on a sports team in one very important way: “We all practice, but no one sits on the bench,” he said. Chinen takes great pride in the fact that the 2015 Rose Parade will feature a float that pays tribute to the soldiers of the 442nd Regimental Combat Team and the 100th Battalion, many of whom hailed from Hawaii. Very impressed with Richard Chinen! We have been Parade Followers since moving from Canada in 1954!! Very Sports orientated, especially Skiing, having served on National Ski Patrol for 30 years! Two sons are still active! We are interested in the possibility of designing a National Ski Patrol float for the Parade! Where do we start!